From a court filing dated Dec. 11, 2015. Red highlight by PP Blog. DEVELOPING STORY: (5th Update 8:18 p.m. ET U.S.A.) MLM attorneys Gerald Nehra and Richard Waak will sign a confession of judgment for a whopping $100 million and acknowledge that Zeek parent Rex Venture Group “in fact operated an unlawful Ponzi and pyramid scheme” under the terms of a settlement agreement with Zeek Rewards’ receiver Kenneth D. Bell, according to new court filings. The news comes as Nehra and Waak also are being pursued by class-action attorneys for alleged misdeeds involving the TelexFree MLM scheme broken up by the Massachusetts Securities Division, the SEC and the U.S. Department of Homeland Security in 2014. 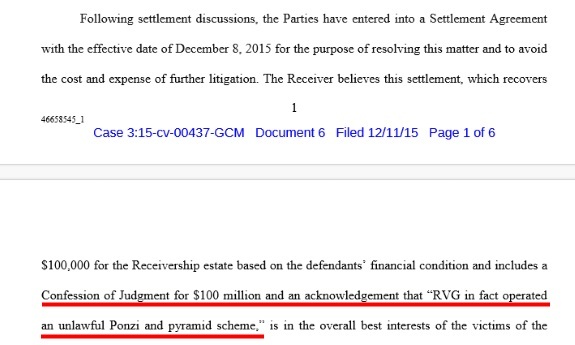 A judge must approve the settlement proposal with Bell in which the MLM lawyers contend “that they acted in good faith as legal counsel,” but now “acknowledge and agree that, based on their current knowledge, during the period they served as counsel RVG in fact operated an unlawful Ponzi an pyramid scheme involving an unregistered investment contract that caused hundreds of millions of dollars in losses to innocent victims of the scheme,” according to filings from Bell. In 2008, Nehra argued that AdSurfDaily — a $119 million Ponzi scheme — was not a Ponzi scheme. His own client, Andy Bowdoin, later disagreed. Nehra then became involved in both Zeek, a scheme that allegedly gathered more than $850 million, and TelexFree, which allegedly created more than $3 billion in bogus economic activity. All three “programs” used similar business models. The cascading fraud totals have been a source of considerable concern. The settlement proposal with Bell hints the MLM attorneys, who acknowledge no liability to the receiver, already may be wiped out in that it calls for a payment of $100,000, a small sum compared with the confession of judgment for $100 million. “The Receiver believes the financial settlement, Confession of Judgment in the amount of $100 million and the acknowledgement of the existence of the Ponzi and pyramid scheme reached as part of the negotiation process is the best outcome for the Receivership and that even with the expenditure of additional funds to obtain a judgment there is not a likelihood of a materially increased recovery for the eventual distribution to the Zeek victims.” Bell wrote. The PP Blog reported last month that a settlement was possible. 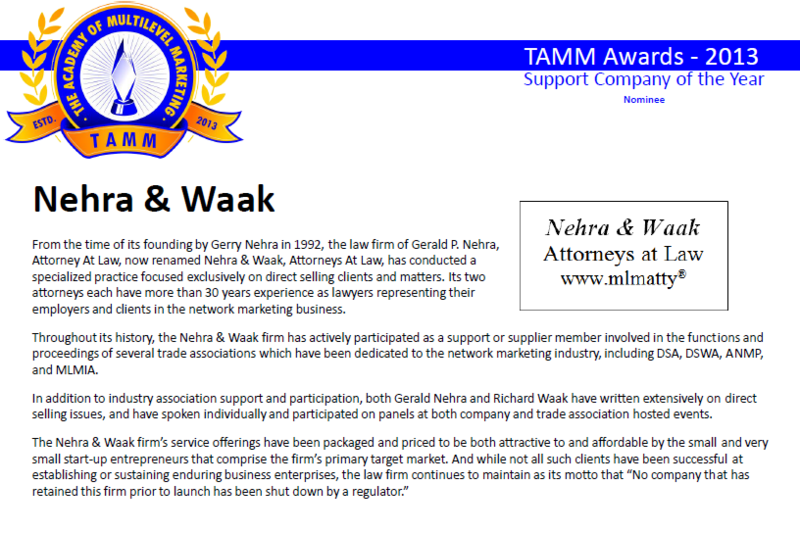 For those to didn’t know, Gerry Nehra and his firm Nehra & Waak had been nominated for the Support Company of the Year award by “The Academy of Multilevel Marketing”. (I didn’t know. I didn’t care either).